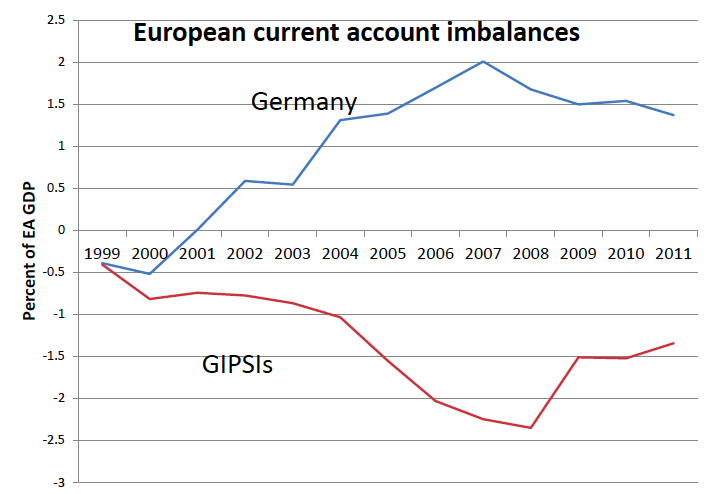 Home > Economics help blog > economics > What is to Stop a Second Euro Crisis? What is to Stop a Second Euro Crisis? Suppose, the Eurozone stumbles through this crisis. Suppose countries avoid leaving the Euro and endure several years of low growth and internal devaluation? What is to stop another Eurozone crisis occurring in 5 – 10 years time? The examples of Iceland and Argentina, where recovery has been impressive, offer some hope, though – although Argentina’s default took place at a time when the global economy was on the up. Default and devaluation have happened before. Leaving the Euro could cause terrible immediate costs. But, it would leave a country responsible for its own fate. It wouldn’t feel like a European power was dictating spending cuts and job losses. At least, they would avoid getting into this situation of an overvalued exchange rate again. Given how spectacularly the Euro has failed southern European countries, how desirable is to stay in a monetary system which fundamentally doesn’t work for you? ← Is the UK tax system fair?